As Christmas is now only weeks away – it seems to come quicker every year, even more so now that I’m a parent and I have to start planning these things far in advance of them actually occurring – it seemed only right to start hunting down some Christmas-themed horror to review on the blog. 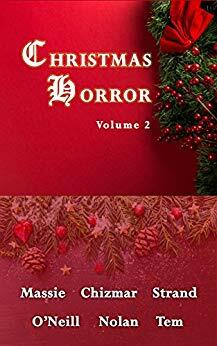 What better way to start this blood-soaked Yuletide journey, then, than with an anthology of stories based on that theme – the appropriately-festive Christmas Horror Volume 2, released by one of my favourite publishers of dark and Mythos fiction, Dark Regions Press. Six stories of festive horror written by six horror authors at the top of their game – I was intrigued to see what they could come up with to make such a universally-loved holiday something to be chilled and horrified by. A modest but festive-themed piece of cover art lured me into the anthology, as did the quality of the authors displayed on the front cover, and my previous very positive interactions with Dark Regions Press and their publications. The anthology kicks off with Christmas at the Pattersons by Elizabeth Massie, who brings the Christmas cheer by centering a story in the midst of a small town in the United States that’s dominated – economically, socially and culturally – by the Patterson family; they own almost the entire area, to the extent that it’s practically a reversion to one of those old 19th Century Corporate Towns, and as both Mr and Mrs Patterson are obsessed with Christmas, the yuletide traditions start as early as August. That alone was enough to generate a grimace from me, but Massie goes much further by deftly evoking the inherent horror in the artificial sterility of corporate Christmas decorations and traditions that have become divorced from the original mythology and cultural meanings that spawned them. The over the top nature of the decorations that the Patterson’s are so fond of, and the way that they’re used as the merest fig-leaf for the social and economic influence that husband and wife wield sadistically and mercilessly over the town’s inhabitants. But then, during the annual Christmas party at the Patterson abode, protagonist Donna accidentally commits a breach of social etiquette, overcome by the boorish behaviour of Mrs Patterson. Unfortunately it turns out that Mrs Patterson is not at all what she seems, and her anger is unleashed on poor Donna; she takes a violent exception to the poor woman, and her terrifyingly Christmas-themed and exceptionally (and delightfully, for the reader) sadistic. A wonderfully twisted take on Christmas, and a great opening to the anthology. I Saw Santa from Steve Rasnic Tem takes that cherished Christmas scenario, the small child waiting up through the night in the hopes of catching a glimpse of Santa Claus coming down the chimney, and gives it a savage twist laced with obsidian-dark humour. Little Tommy is staying up, but he’s not the benefactor of a happy household; it’s only hinted at in the story, but suffice to say his parents are not good people. The mention of child abuse made me cringe, but while it’s at the heart of the story, it isn’t the sole focus – that belongs to the demonic-looking Santa that appears out of the chimney one Christmas Eve. The author has a great turn of phrase here, describing Santa with equal parts gusto and nauseating detail, making it clear that, whoever this figure is, it isn’t the stereotypical jolly, happy fat man. The dark humour comes through Santa’s personality and mannerisms, as well as his interactions, with Tommy, and the plot elicited more than a few chuckles from me as it progressed. I won’t spoil the ending, but suffice to say that this is a twisted, gross-out and hugely entertaining take on another Christmas trope, which had me grinning even as the butchery took place. I don’t think there are many writers who could get me to emphasise with a mass-murderer, especially one who kills around the Christmas period, but with December Birthday Jeff Strand has managed that impressive feat. His contribution may only be a few pages long, but it’s an absolute gem and by far the highlight of the anthology. I’ve always dimly sympathised with people who have birthdays that take place too close to Christmas and result in the dreaded ‘combined present’ but here Strand eloquently puts forth one such person’s anguished pleas, and the bloody results. It’s a shocking piece of short fiction with the intention of hoping humanity will learn from these (currently only fictional) deaths to prevent these joint presents from occurring in the future. Will we learn from Mr Strand’s plaintive call to action? Only time will tell. Finally, Richard Chizmar closes out the collection with his Silent Night which, appropriately enough, brings us back from the black humour and gleeful mayhem of the previous stories and grounds itself in the plentiful horrors that humanity can generate without recourse to occult entities or demonic Santas. Instead, Chizmar presents a powerful and emotionally-laden tale of a man returning home for Christmas, perhaps for the last time; though he loves his family, he can never see them again, never acknowledge them or celebrate something like Christmas, and he’s become nothing more than a ghost, a rapidly-fading memory, for reasons beyond his control. It’s a bittersweet and resonant piece of fiction, which lingered on in my mind long after I’d finished reading the anthology.